In 2000, the majority of tech acquisitions were primarily stock. One company would buy another using its own shares, instead of paying for the target business in cash. But since then, there’s been a secular trend to cash deals. In 2014, 90% of the tech M&A transactions consummated by companies, and excluding private equity firms, in the US with disclosed deal values were cash deals. 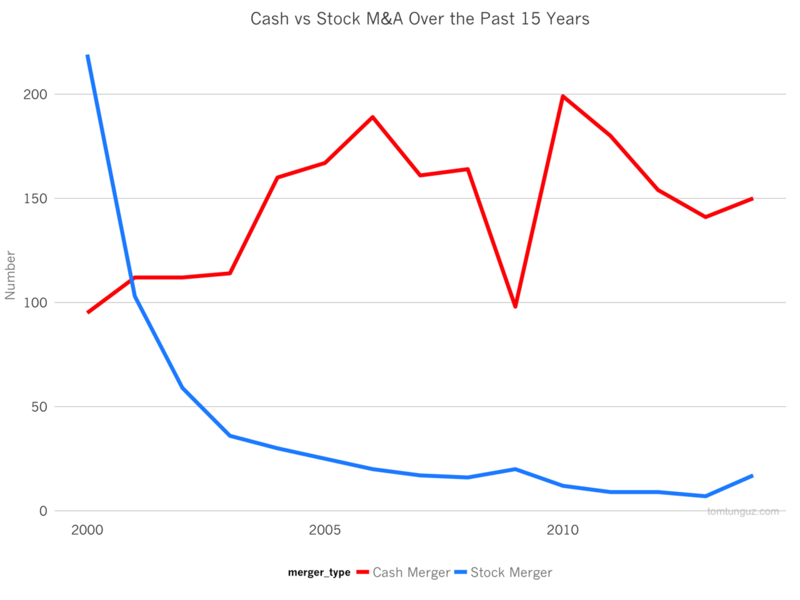 As the cash balances of large tech incumbents balloons (Apple is at greater than $30B, Google at more than $65B, Microsoft has $95B, etc), more and more M&A is primarily cash, because cash is cheap and interest rates are low. The best return on capital then is acquisition or stock buy backs which hit a record high earlier this year. In gross terms, the same story holds true. In 2014, companies spent $22.4B of cash to acquire, compared to $864M in stock. 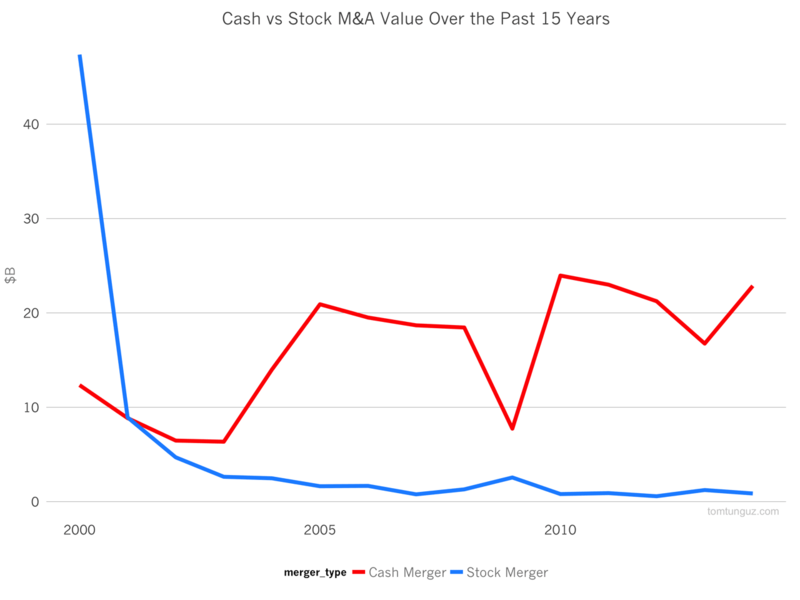 Interestingly, the median value of a cash transaction is 3x the size of a stock transaction, at $150M compared to $50M. Typically, cash transactions are better for founders. There’s no risk of the transaction value depreciating with the fluctuations of the stock market. And the data shows the prices are typically much higher, although that’s probably more correlation than causation - more attractive companies demand better terms including higher prices and cash transactions. 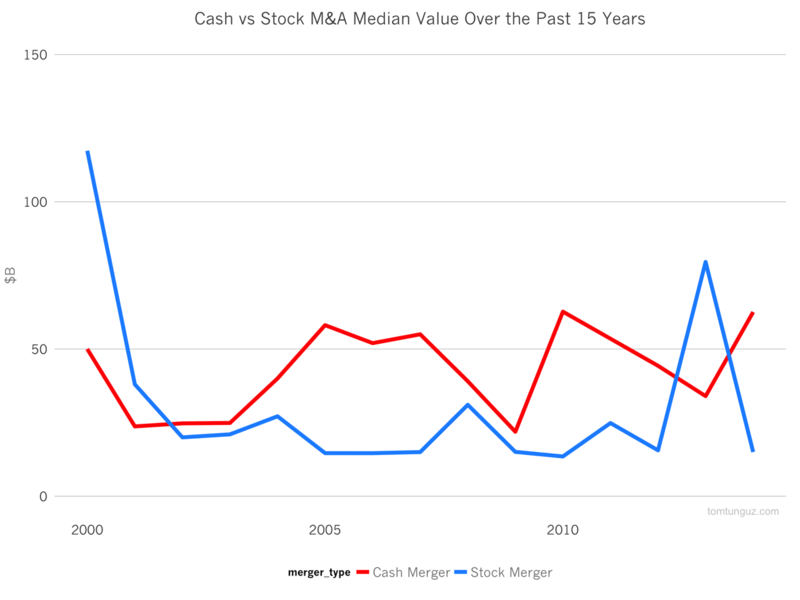 Because the cash balances of large tech incumbents continues to rise, and because of the low interest rate environment, we should continue to expect M&A to be completed primarily in cash.